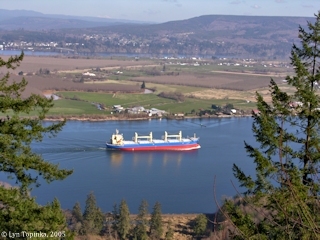 Click image to enlarge Cargo ship passing Puget Island, Washington. 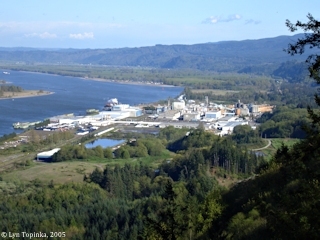 View from Bradley State Wayside, Clatsop Crest, Oregon. Image taken February 19, 2005. The Bradley State Wayside (also called Bradley State Scenic Viewpoint), located on Nicolai Ridge at Oregon's Clatsop Crest, was one of the first parcels donated as park land to the Oregon Highway Commission in 1922. 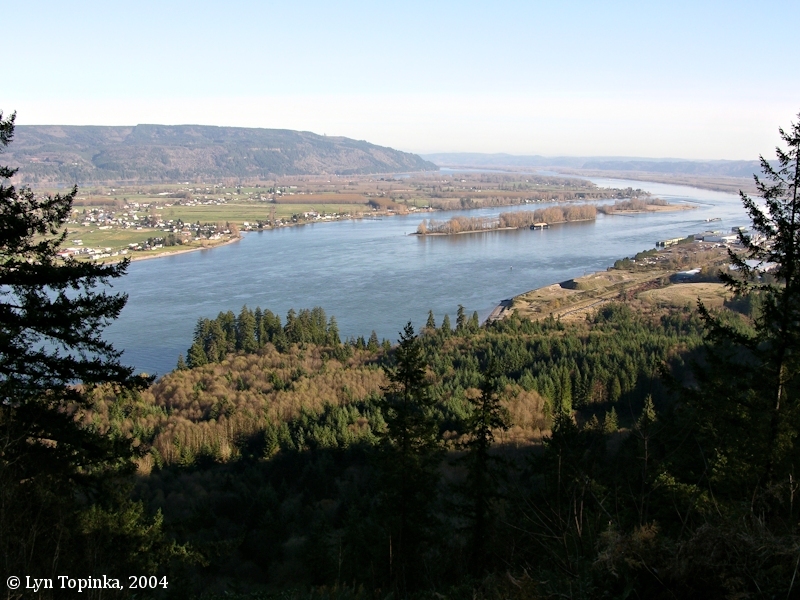 The park features a restroom, monument, and tremendous views of the Columbia River, Puget Island, and Wauna, Oregon. Bradley State Wayside is located on Oregon's U.S. Highway 30, twenty-two miles east of Astoria, Oregon. 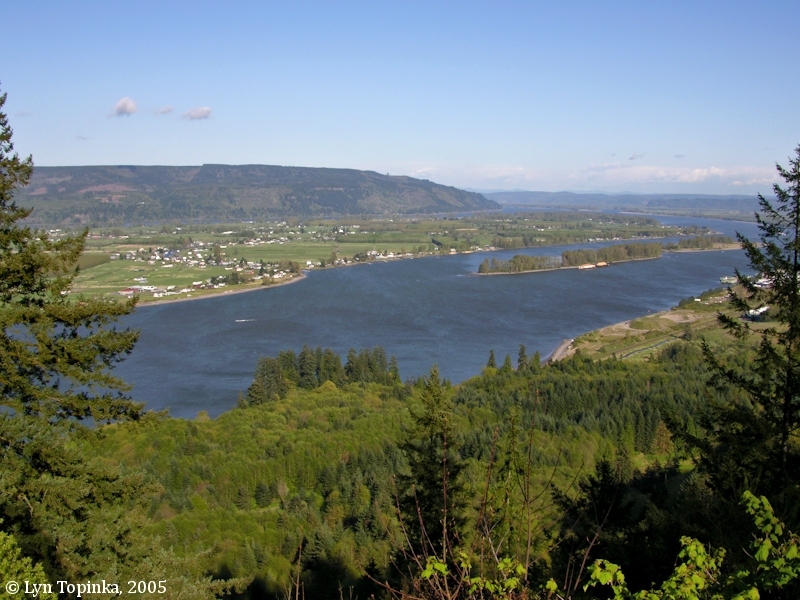 Bradley Wayside is located on Oregon Highway 30 at Milepost 79.9 and Columbia River Mile (RM) 40. Upstream is Wauna and Westport and downstream are Bradwood and Clifton. 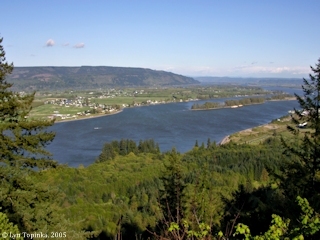 Click image to enlarge Bradley State Scenic Wayside, Oregon. Image taken November 20, 2004. 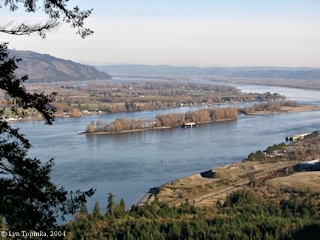 Lewis and Clark passed by this area on the Washington side of the Columbia River north of Puget Island. 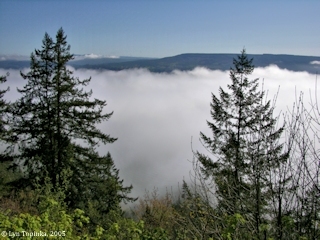 Click image to enlarge Fog, from Bradley State Wayside, Oregon. The Columbia River and Puget Island, Washington, are under the fog. 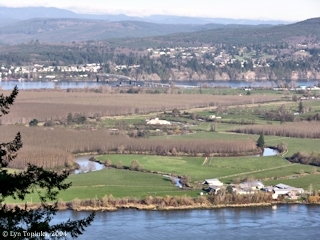 The hills of Washington State are in the distance. Image taken April 19, 2005. 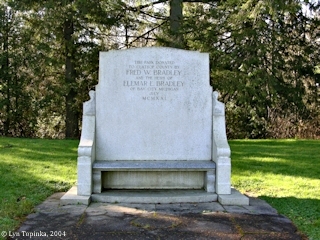 "Under agreement between the County Court of Clatsop County and the heirs of the Bradley Estate, a tract of twenty acres including the site known as Clatsop Crest is to be deeded to Clatsop County for park purposes, the consideration being the erection of a monument at the expense of the County to be approved by the donors of the property. The deed is understood to be in escrow pending fulfillment of the consideration, with the County Court having awarded a contract for the construction of the monument. 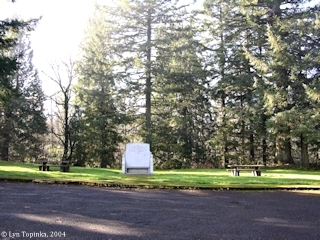 It is expected that the park will be turned over to the State to be maintained and improved as a State park and, in anticipation of this action, filing has been made on the necessary water supply and a small amount of improvement work has been done in the way of construction of temporary comfort stations, et cetera. This park will cover and protect for public use the most valuable point from a scenic aspect along the lower Columbia River Highway and its control by the State is, for that reason, especially desirable." Source: Oregon State Highway Commission Fifth Biennial Report, 1921-1922. 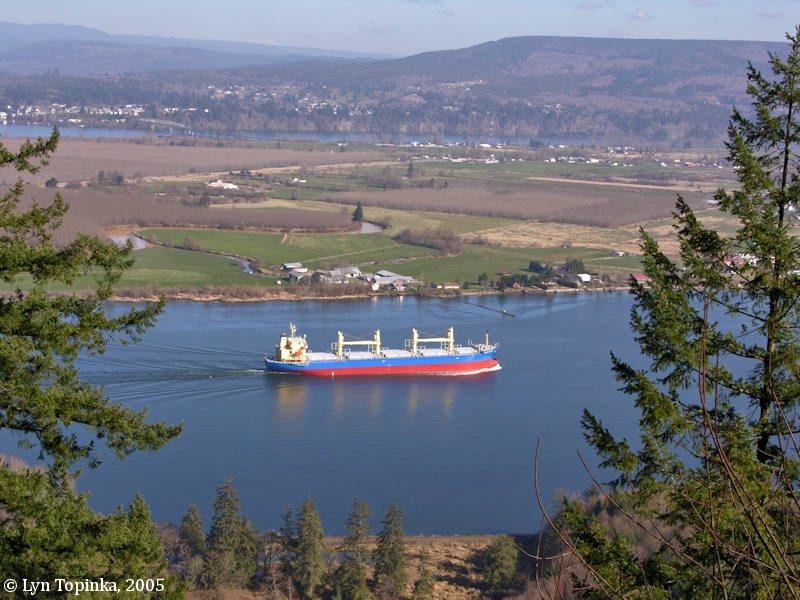 "Bradley Wayside is located on the lower Columbia River Highway about 22 miles east of Astoria at the summit of Clatsop Crest in Clatsop County. 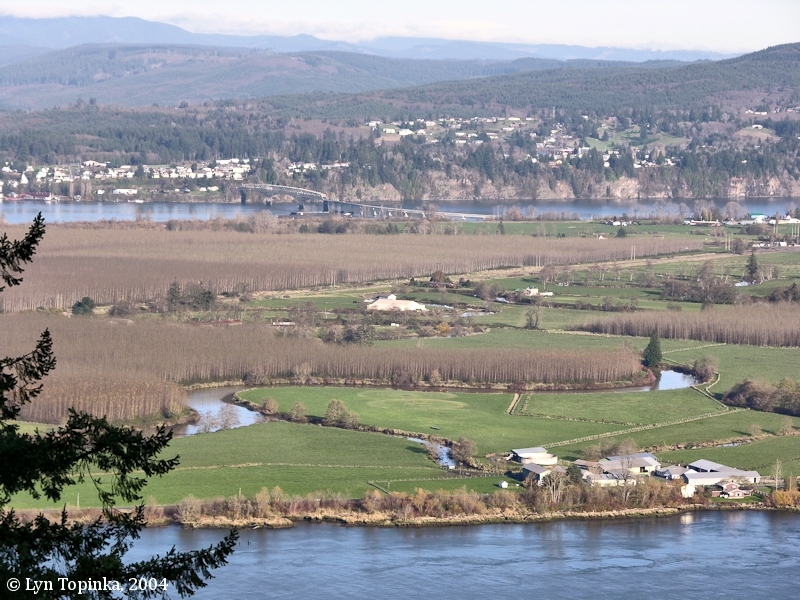 This delightful area of 18.08 acres was first given to Clatsop County as a park by the heirs of the Bradley estate in 1921. By an agreement the Highway Commission obtained the area on March 25, 1922, but the deed giving title to the state was not signed until April 13, 1932. 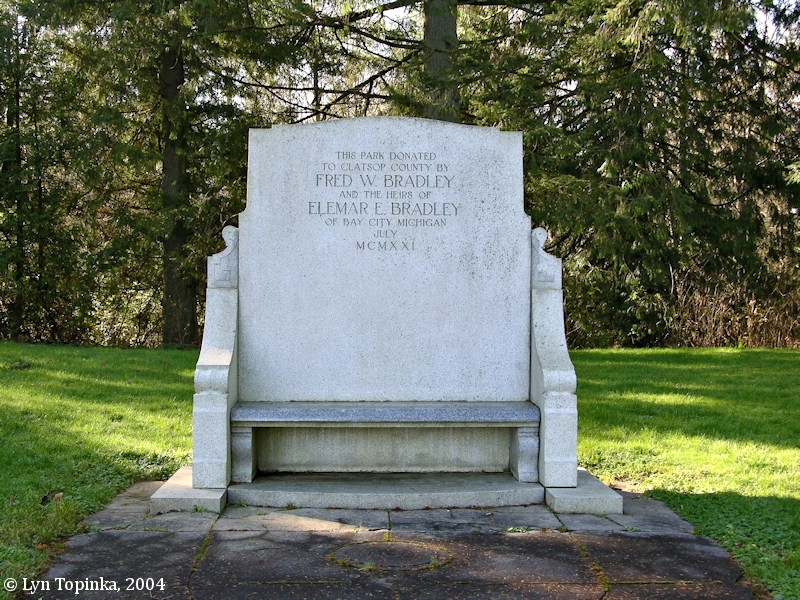 The Bradley heirs approved the deed subject to the same provisions as contained in the deed to Clatsop County. Bradley Wayside is essentially a viewpoint overlooking the Columbia River and its Washington shore. It is covered with a good stand of fir timber and other indigenous species. Developments are a car parking area, picnic area and a water system from a source some two miles to the west under permits #8454 and Q-748 from Kaiser Gypsum, Inc. Sanitary facilities and a caretaker's cottage were constructed in 1923. A concessionaire was obtained who operated under a contract. Many extensions of the contract were made over a period of several years. This arrangement was never quite satisfactory neither financially nor from a park maintenance standpoint. When the highway was reconstructed through Bradley Wayside, it was located south of the buildings. 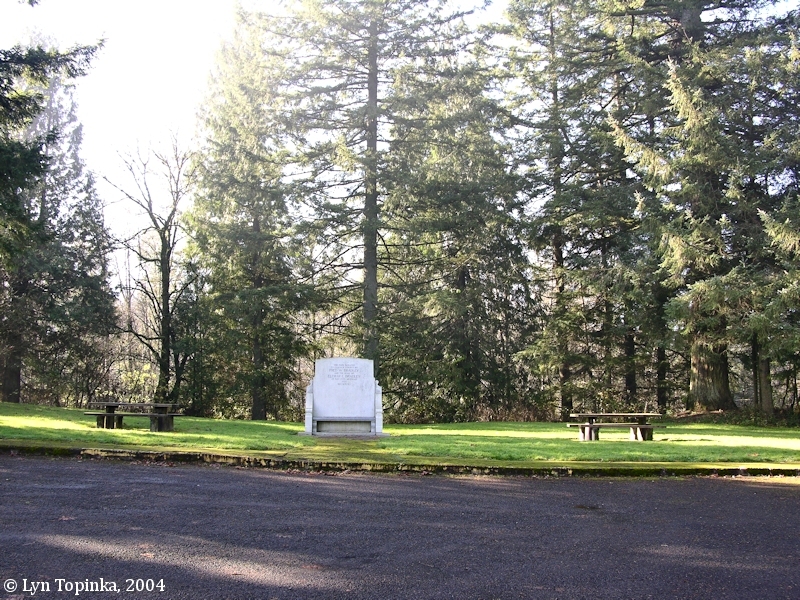 The moving of this road did not interfere with the viewpoint of this park nor did it affect the use of the picnic area. Instead, the provision of a good entrance road resulted in an increase of 15,000 visitors the following year. The 1963 visitor count was 57,028." 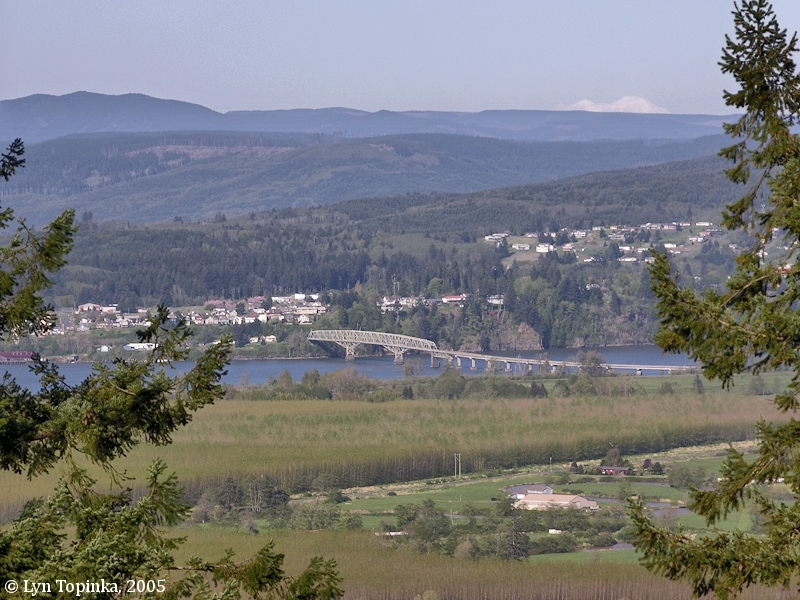 From Bradley State Wayside good views of Puget Island and nearby Ryan Island can be seen, as well as Cape Horn (Wahkiakum County), Cathlamet, Washington, Wauna, Oregon, and the Clatskanie River "delta". On a clear day Mount Rainier can be seen on the skyline. Click image to enlarge Coffee Pot Island, as seen from Bradley State Wayside, Oregon. 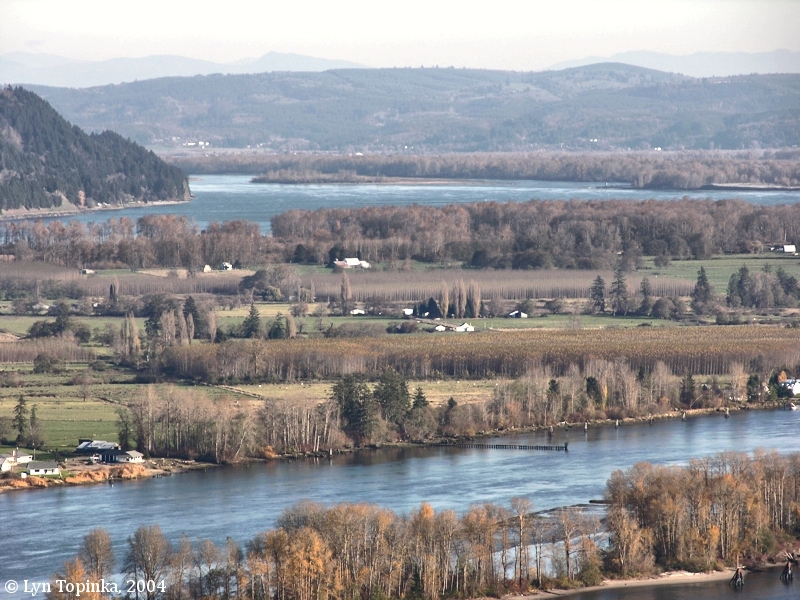 Puget Island and Coffee Pot Island. Image taken November 20, 2004.